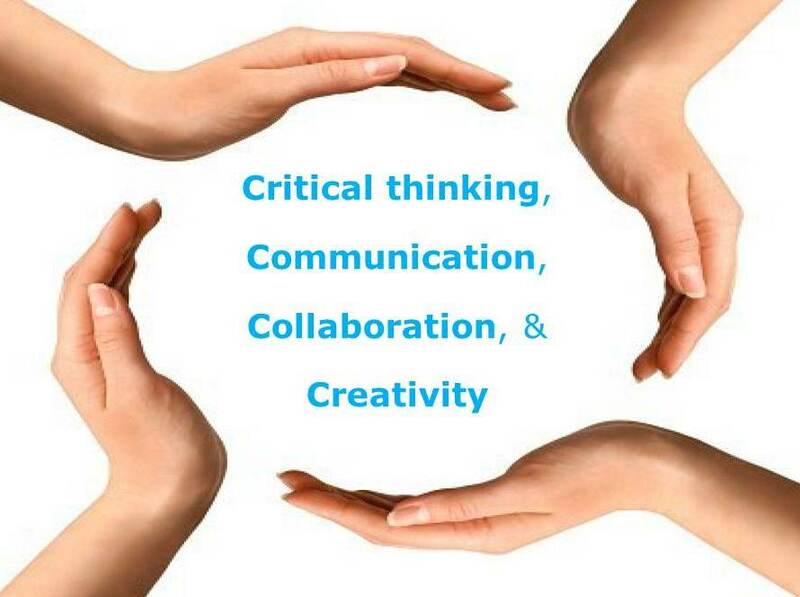 I figured that since the signers of my paycheck now expect me to impart these four abilities to students, that maybe my grade book should reflect these capacities as well. I also know that the famous 4 C’s of 21st Century Learning are important skills for students to possess when they graduate our schools, therefore I thought that should be reflected in my grade book as well. Two of these 21st Century C’s overlap with the SBAC claims. 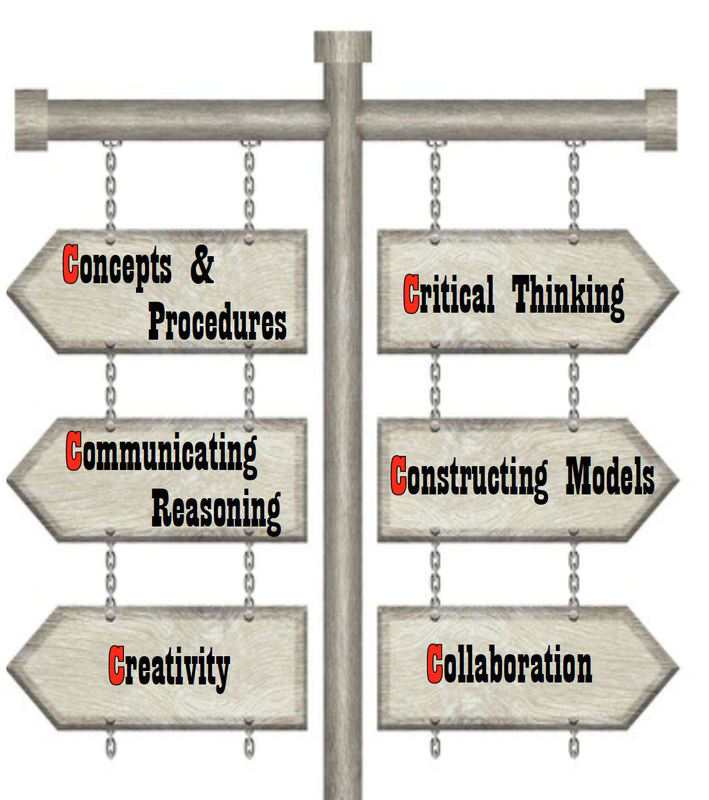 By choosing the phrasing “critical thinking” over “problem solving” and tweaking the SBAC phrase of Modeling and Data Analysis just a bit, I had my own 6 C’s of Claims-Based Grading. Having the picture shown above displayed as a poster at the front of the classroom serves as a constant reminder to students as to why they are in the course. There is much more to math the just busting out algorithms. If they never have to solve an equation in their adult life, hopefully, they will understand the mathematical principles that they hear about in the news, be able to think and communicate in a quantitatively manner, interpret data and represent the story that the numbers tell, solve problems creatively and work collaborative to meet a goal. Claims-Based grading keeps these ultimate purposes front and center in the students’ minds. My students also have a grade sheet that reflects the 6 C’s on which they record the scores they received on each assignment. Any given assignment may have more than one score on it, much like what is done with standards-based grading, with each score being based on a 5-Point Rubric (to be shared in a future post). In other words, after each assignment, students are required to look at how they performed in terms of, say, critical thinking or constructing models, rather than studying for a test. The portfolios in the class are structured around the 6 C’s as well, with the first six of the eight sections being the 6 C’s themselves. After each assignment is recorded, it gets filed in their portfolio in one of the sections that it was graded on. 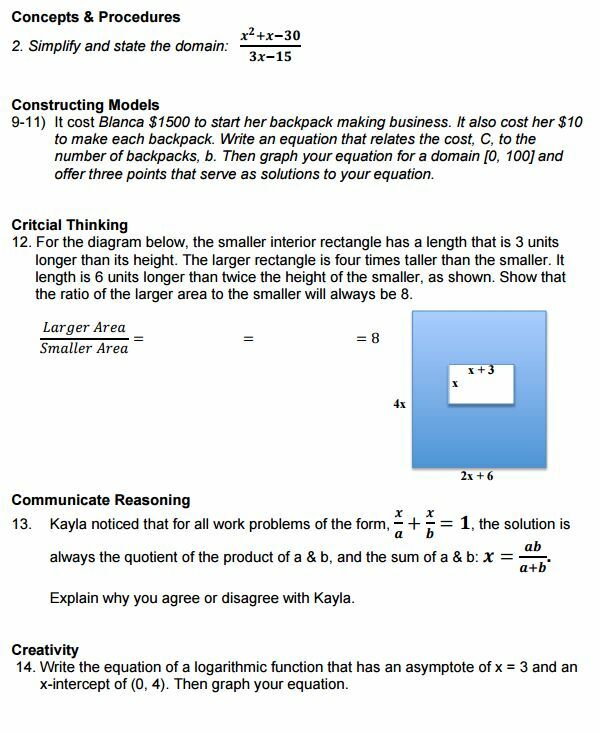 For example, if an assignment was scored on Communicating Reasoning and Creativity, then the student gets to choose into which of those two sections the assignment will be placed. While a Traditional grading system focuses student attention on study habits, and Standards-Based grading focuses them on specific skills, Claims-Based grading focuses them on broader capacities that will serve them well as adults. The greatest benefit of the Claims-Based grading system is how much it reminds me to teach and assess the capacities that I often forget. 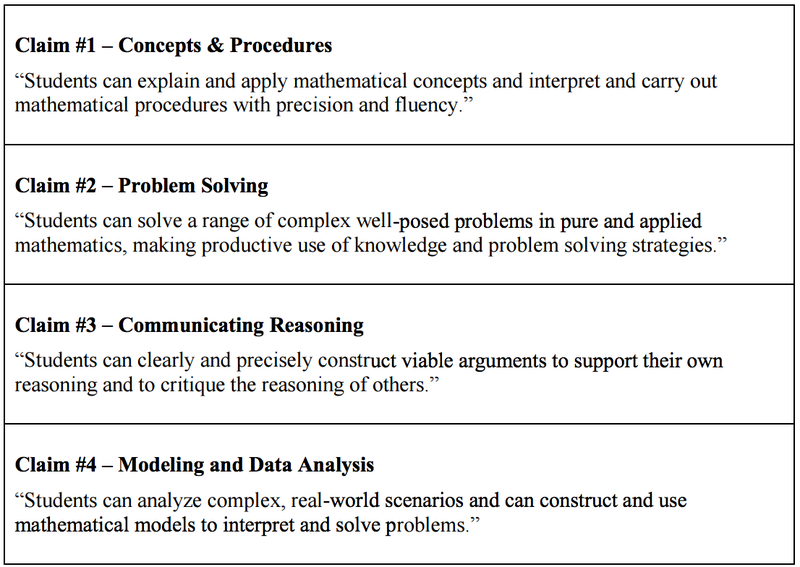 I naturally teach to conceptual understanding, critical thinking, communicating reasoning, and collaboration, but I need to be frequently nudged to present students with tasks that require them to construct models and create unique examples or solutions. For example, a group quiz will pose several claims-based problems on the same mathematical topic with a few cumulative questions as well. The Collaboration grade is always a self-assessed grade by the group, with me holding the power to veto. Quite often, though, they accurately score themselves. This is not surprising since we score it according to the school-wide norms on collaboration. With the exception of the collaboration grade, the scores appear to be fairly consistent. This is interesting since individual students do not show this consistency. They usually have a claim or two that lags the others. The numbers that give me the most pause are the number of items. The few number of collaboration scores is not a concern, because most of the assessments are individual anyway. 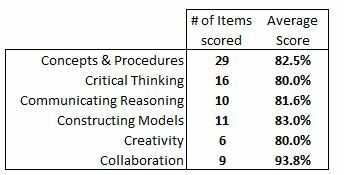 However, I am assessing procedures twice as much as critical thinking, three times as much as communicating reasoning and constructing models, and five times as much as creativity. I’m not convinced this is an issue, but I’m not convinced that it is not one either. There is another interesting phenomenon that has me reflecting on my practices. The final exam scores are far less correlated under this system than with my traditional system. In previous years, I would have only a handful students whose final exam score was different from their classroom grade significantly enough to raise or lower their course grade, and most of those would be an improvement in the grade. Under my new system, there is about a 45% volatility. That means that nearly half of the students score differently enough to change their course grade, with the number being split between raising or lowering the grade. I think this is because the district finals are so heavy on the procedural side, with absolutely no questions addressing modeling or creativity. Students who are strong or weak in the Concepts & Procedures category will then see a gap between their course grade and the final exam grade. I am keeping a careful eye on this dynamic as I move forward with the new grading system. For all the reasons that I have shared, I will be keeping this Claims-Based grading practice for a while. l see myself adjusting the system less, and using it to improve my instruction more. 1) The Mission Impossible theme song for preparing for class: My students each have a Portfolio (3-Ring Binders), a workbook, and a whiteboard. Each pair of students has a “Tool Kit.” All of these must be at their desks, plus their cell phones must be placed face down on the outside corner of the desk. Matt gives them one minute of the song; since my students have to retrieve materials from the portcase, I give them two minutes. We practiced these back to back a few times until we got it down. It works amazingly well! Thank you Matt. Portfolios: I require students to keep a portfolio in class. 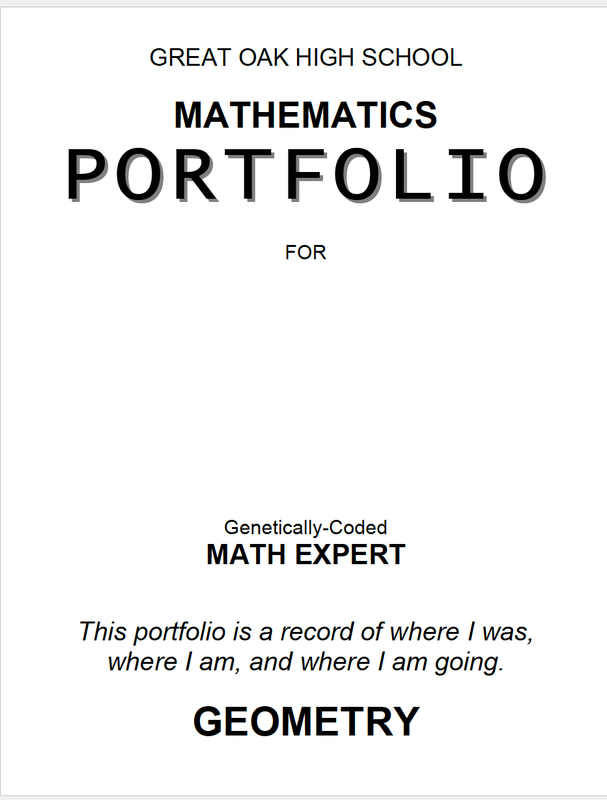 The portfolio has a cover sheet that intentionally refers to them as “Genetically-Coded Math Experts.” I used today to reinforce the 6 C’s as our ultimate goal of the course, which I introduced yesterday. The portfolio is structured around these six values as is my grade book. My students from last year, received their portfolios back from Algebra 1; the new students received a free binder from an anonymous donor. We built the portfolios section by section. “I thought your article was brilliant. My teachers hated it.” Those were the words of my friend who is the Instructional Coach at his high school. He was referring to an article that I wrote several years ago titled Barbie and Beavis: Holding Students Accountable … to What? In essense, the article questioned whether teachers were basing grades on competency or compliance. The point I made was aligned with Robert Marzano’s question “What’s in a grade?” By having his colleagues read my piece, the coach was obviously challenging the traditional practice of grading students on effort rather than performance. Interestingly, the teachers pushed back, insisting that a grade absolutely should be all about the effort. I am not surprised that these old school habits are still pervasive in the age of accountability. I just found it curious that the teachers were so vocal in publicly defending a practice that has been repeatedly debunked by both research and antecdotal experience. Afterall, where is the evidence that any school has shown drastic improvement by flunking a bunch of kids for not doing homework? I wonder if the arrival of the common core and it’s significantly different assessment strategy will force teachers to rethink and retool their own grading practices or will they simply continue with the same-old same-old and just tolerate another annoying state test once a year. Beavis & Barbie: Holding Students Accountable … to What?